Budget grey pin board notice board for internal use. 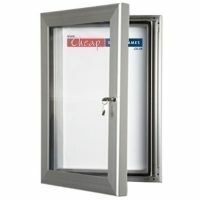 This lovely grey pinboard has a hinged door with allen key locks to protect your posters. The grey felt back is flame resistant so great for safety, and it has a silver anodised aluminium frame so looks really nice. Available in two sizes, 900mm x 600mm and the large 1,200mm x 900mm. Would the medium or the large size would work best for you? 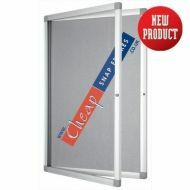 From only £62.90 + VAT and delivery.